Our diverse experience in the industrial automation industry has prepared our team to identify and overcome a variety of challenges presented by our clients’ products, facilities and processes. Recently a national wet wipe manufacturer tasked us to develop an advanced handling system to integrate into their existing facility. This was an entirely new manufacturing line, custom designed to increase production to meet new orders and keep up with demand. The first challenge the product posed was the nature of the product itself. Due to the wet, damp characteristics of the wet wipes prior to packaging, the entire handling system was designed and built with stainless steel conveyor components. The second challenge was accumulating wet wipes from the converter. To ensure the handling system operated seamlessly, we teamed-up with a conveyor chain manufacturer to design custom chain that would allow accumulation of a wet product, or in this case, the wet wipes. This process took place in the low-pressure accumulation area noted in the system plans. At Wrabacon we welcome these challenges to keep our knowledge and skills ahead of the rest. 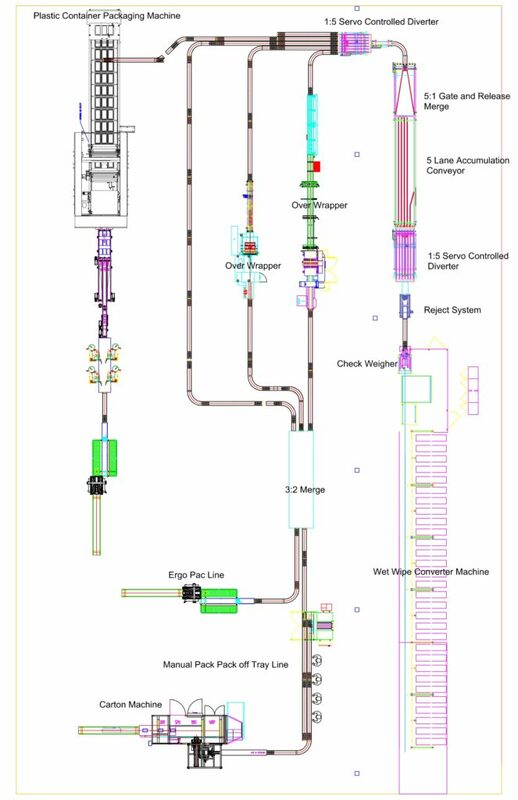 The basic process for the handling system is as follows. The wet wipes are produced from a converter and transported to an accumulation system which then feeds two existing high speed over wrapper packaging machines. If wipes are not sent to the over wrappers they are sent to a machine that places them into plastic containers. If the wipes are over wrapped the packages are sent via the 3-1 merge to either a hand pack line or a cartoner machine. Stacks of wet wipes transfer through a check weigher in a single file. This effectively measures the weight of the product and indicates that each container has the correct moisture content. Product is then transferred onto a short reject conveyor equipped with an overhead sweep mechanism. This sweep mechanism is used to reject stacks of wipes from the line that could disrupt downstream elements of the handling system. The wet wipes are rejected based on a signal from the checkweigher. After passing through the reject conveyor, the stacks enter a 5-lane tunnel style diverter. In normal operation, the stacks of wipes travel straight through the diverter, enter a merge system around a ninety-degree turn and onto the final diverter. During normal operation the stacks enter the final diverter and are equally distributed to the four downstream lanes. Based on a downstream signal, if a wrapper is not online, the diverter diverts the stacks evenly to the remaining wrappers. If accumulation is required, the first diverter diverts the wipes evenly to five low back pressure accumulation conveyors where the stacks accumulate. Each conveyor is approximately 18’ long and holds 30 stacks of wipes (based on a 7” long product). After the accumulation section, the gate and release merge system releases lanes of the accumulated stacks to merge them back into one lane for the final divert when the need for accumulation goes away. The gate and release merge systems are located at the end of the low back pressure accumulation conveyor. The stacks merge to the center of the merge conveyor using two vertical side belts that help keep the stacks together. Both diverters are “tunnel” style and utilize servo motors for positioning. After the second diverter, we designed and built a series of conveyors that take the stacks of wet wipes to the wrappers. Lane one feeds the closest wrapper, lanes 3 and 5 are the future wrapper lines. Lanes one and two travel around a ninety degree turn and then through to the corresponding wrappers. After the wrappers, the two lines merge into one and enter one of two downstream lines (ergo line or tray line). The tray line will consist of a dual pack off conveyor and a tray conveyor. The merge will be constructed wide enough to handle the future line three. Line four travels straight down to a thermoform line where the stacks are manually loaded into the thermoformer. Production Rate: 225 wet wipes per minute. Product Size: 7 long x 4.25 wide.